Before the arrival of man, New Zealand had been in total isolation for around 79 million years, since its separation from the ancient continent of Gondwana. This land mass of modern New Zealand which separated from Gondwana was known as the Rangitata land mass. The separation period continued, and by 60 million years ago the Tasman Sea, separating Australia from New Zealand, had arrived at its full width. It was five million years ago that the shape of the two main islands of New Zealand today began to form. 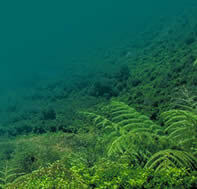 Seven thousand years ago most of New Zealand's land area was covered by rainforest. The surrounding seas protected New Zealand's unique fauna and flora from marauding mammals, and because of this there were many species of flightless birds evolving in safety at ground level. The first explorers to arrive were the Polynesians who sailed / paddled here in canoes apparently from Hawaiki over 1000 years ago. They named this new land Aotearoa (literally translated means "Land of the long white cloud"). 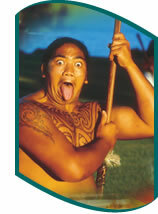 The Maori (as they are now known) finding plentiful supplies of food, quickly colonised both islands. The Dutch Explorer Abel Tasman in 1642, was the first European to arrive here but on attempting to set foot on in the South Island, were met by hostile Maori and a few of his crew were killed. Tasman then sailed up the west coast of the North Island without landing and then left the region. The English Explorer James Cook arrived and completed a circumnavigation of both islands. Cook and his crew managed to befriend the local Maori people and claimed the land for the British Empire. Other Europeans (sealers and whalers) began arriving in the late 1700's prior to the arrival of tourists / writers / photographers (among others were Rudyard Kipling and Mark Twain). Migrants started arriving in increasing numbers but Land settlement problems between Maori and the settlers saw the signing of the Treaty of Waitangi in 1840 with the Maori giving sovereignty of their land to the British Crown in return for protection of their people and their land. This Treaty was not well received by all Maori and some new immigrants. War broke out in 1860 and lasting nearly a decade with no real solution. Peace finally arrived and New Zealand is now a cosmopolitan mix of British/ Europeans/ Maori / Pacific Islanders/ Asians with smaller numbers of more recent arrivals from Eastern and Middle Eastern Europe, South Africa.